Cheers to a Hoppy Valentine’s Day filled with Michigan Brews! Celebrate this loving holiday with someone to close to you and a Michigan brew that is near and dear to your heart. Try any one of these rich, chocolate, dessert-like, or fruity beers (or one with a sultry, loving or romantic name), and fall in love. Velvet Moose Chocolate Oatmeal Stout (6.6% ABV | 20 IBUs). A Nitro beer combing 7 malts give this beer a rich, smooth, chocolatey taste perfect for a Valentine’s Day sweetheart. Espresso Love (6.7%ABV | 15 IBUs). Oatmeal and 20 pounds of fresh roasted 100% fair-trade coffee, from the nearby Ugly Mug Café Brewed, contribute to a mildly chalky espresso character balanced by a rich, sweet creamy maltiness. The coffee finish dissolves into chocolate, with a slight roasty bitterness. Pairs well with Valentine’s Day desserts, especially dark chocolate, raspberries, and cheesecake. Cheap Date (4.5% ABV). If you’re looking for uncomplicated fun, look no further, you’ve got a Cheap Date. Keep it casual and enjoy the moment with this standby of high drinkability. A refreshingly hoppy session pale ale, it hosts a fine white head and gorgeous aroma mirrored by its flavor which is overloaded with tropical Citra hops, citrusy Simcoe hops, and a perfect malty balance. A great anytime beer that pairs well with good, cheap fun. Going Steady IPA (4.6% ABV | 55 IBU). This citrusy session has got enough Cascade hop and grapefruit flavor to go around, with just enough of the good stuff to make whatever it is you like doing a little bit better. Full bodied flavor that rocks any situation while keeping you rock steady. Decadent Dark Chocolate Ale (5.2% ABV | 11 IBU). Holding true to the Northern English tradition, this beer has at its foundation a nutty profile with a round mouthfeel. Added is a chocolate extract consisting of three blended chocolates of varied depth. The result is a rich, but not overtly sweet, experience for both the beer and the chocolate enthusiast. Lip Lock Cherry Stout (ABV 6% | 16 IBU). A blend of fully fermented fruit and toasted, nutty malt characters bring forth an elusive cherry wood aroma to the finishing kiss. Smitten Golden Rye Ale (6.0% ABV | 42 IBUs). This spring seasonal offers rustic flavors from rye malt combined with citrusy, resinous hop aroma from Pacific Northwest varieties to create a crisp, refreshing take on the classic pale ale. Perfect for to share with someone you’re smitten about! Man in Black Oatmeal Stout (7% ABV). Man In Black is a classic American Stout with a malty, balanced, chocolate body. Rich and warming, perfect for cooler weather and pairing with hearty meals, or just enjoy this comfort food in a glass all by itself. Our tribute to American music legend Johnny Cash. Aphrodisiac (8.4% ABV | 41 IBUs). Enhance your romance this Valentine’s Season with the seductive flavors of Chocolate and Pomegranate! We combined three of the most intoxicating Aphrodisiacs on the planet (chocolate, pomegranate, and alcohol) to create this lustful brew. You’ll taste the passion that makes this love at first sip. Willy’s Oompa Loompa Chocolate Stout (6% ABV). It is best described with two simple words: Chocolate and Stout. Great in combination with each other, these flavors combine for a flavor explosion. This brew fills the palate with slightly sweet, super chocolate, malty flavor. If Stout is a meal in a glass, this beer includes dessert. Redwing Raspberry Wheat Beer (5.2% ABV). A light wheat beer brewed with natural Raspberry extract and puree. This beer starts with a subtle sweetness and moderate tartness, and finishes with a palate-cleansing raspberry flavor that will leave you wanting more. Chocolate Kiss Stout is a big creamy luscious beer that is perfect for Valentine’s Day. Using a large amount of Chocolate malts and cocoa nibs to give a true chocolate flavor this beer is then combined with real raspberry or strawberry to give it even more decadent flavor. When done this beer is like drinking pure creamy cocoa that is sure to please everyone this Valentine’s Day. Yours Cordially. This Cherry Porter was the winning homebrew recipe from the Livingston Social Brew Crew’s cherry brew competition! There isn’t any actual chocolate in the beer, but the chocolate and caramel malts play well off the cherry addition to give the impression of that beloved confection. iO Saison (6.8% ABV). Part of the Baudelaire series, this beer will capture the hearts of art and artisan beer lovers alike. Drawn in by the historic elegance of the label design and then held tight by the rapture of flavors, it will be released in limited quantities. iO Saison is brewed in a lovely fashion, with rose hips, rose petals and hibiscus. Yet, don’t be easily deceived by her looks, for like love – she can be oh so dangerous. Love Fuel (3% ABV | 6 IBUs). This raspberry beer looks like pink lemonade and smells like a fresh combination of fruit and German yeast with a tasty, bubbly flavor. Strawberry Cream Dream (6.5% ABV | 20 IBUs). A Valentine’s Day beer release, this American Cream Ale was made with 40 pounds of fresh strawberries and 30 pounds of graham crackers. Sweet and delicious just like your Valentine, served with a graham cracker rim and topped with a fresh strawberry. Steamy Windows (4.7% ABV). This “steam” style beer is made with a lager yeast and fermented at ale temperatures and then aged at lager temperatures for a smooth, clean finish. Very much like a pale ale, this California Common is fermented with a lager yeast to create a crisp taste with fruity notes. Chocolate Covered Cherry (7% ABV | 22 IBUs). A blend of two of our most popular flavors with the chocolate character of our Liberty One Porter, blended heavily with our Cherry Cider, making this a dessert like drink. Sacred Gruit (5.8% ABV | 4 IBUs). The flagship gruit brewed with 3 different herbs that stimulate the mind, create euphoria and enhance sexual drive. For a little added fun, try the Peach Gruit, with peach juice added. Milkshake Stout (5.3% ABV | 20 IBUs). The combination of four different malts, along with a low hop level creates a deep dark beer featuring rich, roasted, malt flavors. The addition of lactose (milk sugar) adds complexity, body, and a residual sweetness lending a smooth creamy texture to this full-flavored brew. Red Velvet Ale (5.28% ABV | 20 IBUs). A decadently dark ale with the rich velvety chocolate notes reminiscent of the popular dessert. Chocolate Covered Strawberry (5.1 ABV | 21 IBU’s). Chocolate Covered Strawberry is a Brown Porter brewed with chocolate malt, strawberries, and lactose. Rich mahogany in color, Chocolate Covered Strawberry has a white head that clings to the glass. With aromas and flavors of strawberry and chocolate, this beer does its name justice. Full-bodied and creamy, this Porter is well balanced with a dry finish. Chocolate Wheat (7.3% ABV | 30 IBUs). Chocolate Wheat is a Porter brewed with chocolate malt, wheat malt, and specialty grains. The combination creates a deep black, full-bodied beer that provides subtle hop flavors and rich malt tones. Chocolate Wheat has balanced flavors of roasted caramel, coffee, and chocolate, and ends with a smooth finish. Hot Loins. A beer brewed with aphrodisiacs: Pomegranate, vanilla, honey and the most powerful aphrodisiac of all time – Tongkat Ali – aka longjack. Is this Love (4.8% ABV). Bright, clear, and yellow in color, Is This Love is Short’s first true gluten free beer; brewed with quinoa, sorghum, green tea, honey, and lemon peel. Aromas of sweet lemonade lead into a light bodied tasting experience of distinct grain with a delicate tartness. Love Knife (6.7% ABV | 45 IBUs). A brownish red Belgian ale that explodes with aromas of strawberry, banana, and nectarine. Malt sweetness is quite low, allowing for the fruit flavors to be apparent throughout the beer. Power of Love (2.7% ABV | 20 IBUs). Power of Love is a truly unique pink-colored Shandy created by blending Northwoods Soda & Syrup Co. Gourmet Lemonade and a Wheat Ale brewed with raspberry and rosemary. Enticing sugary aromas intermix with appealing citrus and herb fragrances. Very sweet lemon flavors give way to a shock of tart raspberry before turning sharply dry, as if eating a piece of grapefruit. Sonja. A dark ale brewed with chocolate, raspberries and bright Swedish smiles. Stormcloud is hosting a beer dinner on Valentine’s Day that will pair Sonja and other brews with housemade Scandinavian cuisine. Love Pump (9.3% ABV). Dark, roasted stout made black treacle and crystal rye malt. Revilo. This fierce red lager is brewed using a unique malt bill that not only gives it its beautiful garnet hues, but also creates Revilo’s intricate caramel and toffee flavors. We couple Noble hops in the first part of the brew — which give the beer its trademark bitterness — with fruity American hops for flavor and aroma, and the combination produces our caramelly, malty, hoppy India Red Lager. Of course, there are countless other beers to LOVE…and we think the best one is the one in your hand. 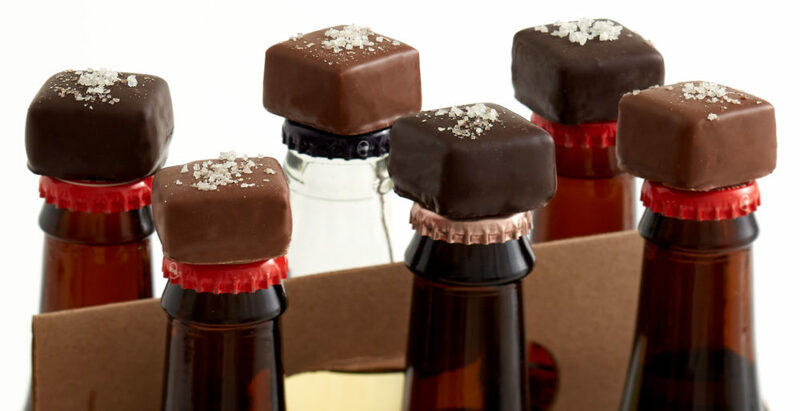 What other decadent, chocolatey #MiBeers do you love? Share details below.